If you’ve been following our blogs for any amount of time, you know we are pretty obsessed with the Houston food scene. At Amazing Spaces, many members of our team are avid travelers. The problem with traveling? We have the BEST food right here in Houston. Don’t believe us? Check out this article discussing how the Houston food scene as one of the best in the world. Kenny & Ziggy’s – Our Property Manager at our Medical Center ~ West University location, Missy, speaks very highly of Kenny & Ziggy’s. They’re adding a fun twist to celebrate the 4th of July by changing the look of their cheese blintzes to be red, white, and blue! JerryBuilt – Who doesn’t love a good ole fashion cheeseburger to kick off 4th of July celebrations? Even better? Get a free milkshake at any of JerryBuilt’s 3 Houston locations in honor of our nation’s birthday! Eight Row Flight – if you haven’t had the opportunity to check out Eight Row Flint, now is definitely the time. From 2PM to midnight, Eight Row Flint will be hosting a 4th of July party bash with music, American hot dogs, live music, and awesome happy hour prices. Who’s in the mood for an Old Fashioned? Cyclone Anaya’s – This is one of my favorite places for Mexican food. While it may seem strange to have a Mexican brunch on the birthday of the United States, there’s one red, white, and blue shining reason to do so. Cyclone Anaya’s will have patriotic margaritas, colored red, white, and blue. What an Amazing city we live in! BRC Gastropub – Hop aboard the Houston Wave jitney for a burger and beer pairing, private tour and tasting at Buffalo Bayou Brewery, and land at Silver Street for fireworks! The Houston Symphony will be performing at a FREE concert featuring Tchaikovsky & Mendelssohn this Friday. The concert begins at 8:30 pm at Miller Outdoor Theatre. Learn something new this Fourth of July. Tour the WWII Museum and visit the Hangar of Houston Wine of the Commemorative Air force. This is a neat way to get up close to WWII military aircraft! The hangar and museum are open the 1st and 3rd Saturday each month. Located at West Houston Airport, 18000 Groschke Rd. Who doesn’t love an art market? The First Saturday Arts Market in the Heights has officially begun summer hours from 6PM to 10PM. Enjoy art, music, and fun! Prohibition Supperclub and Bar is having a patriotic performance. I’ve always wanted to go here. Thinking this weekend is the prime opportunity to check it out. Even more Amazing? A portion of food and beverage sales will be donated to U.S. VETS. Bring a toiletry item for US Troops and receive a free cup of punch! Bayou Bend Collection and Gardens – There will be a variety of historic family fun, including performances, crafts, activities, refreshments and beyond. There’s even a 4th Of July lemonade toast and a reading of the Declaration of Independence. Oh, and you can sign a Texas-sized reproduction of the Declaration of Independence. Memorial City Mall – Okay, who thinks 4th of July celebrations should feature snow!? From 5 pm to 8 pm, you can watch ice sculpture demonstrations and play in summer snow flurries. There’s also live music, face painting, balloon art, and more! Towne Lake will have free music, patriotic fun, and beyond at the master planned community’s center. No fireworks this year, so check out the ones at Memorial City, Katy, or CityCentre. If you’re near our Medical Center property, you may want to check out the celebrations in Bellaire.The city is hosting a Fourth of July parade and festival! The parade starts at 9:30AM and the festival (featuring a petting zoo, prizes, and more) goes from 10AM to 1PM. Enjoy five nights of fireworks at The Kemah Boardwalk. What’s really neat about these fireworks? Each night represents a different theme of fireworks including Top 40 June 30, then Classic Rock, ’80s, ’90s and Star Spangled Sky. Houston’s official July 4th celebration, CITGO Freedom Over Texas,is hosted by the Mayor’s Office of Special Events. Festivities will occur from 4 pm to 10 p, with the fireworks’ finale begins at 9:35 pm. 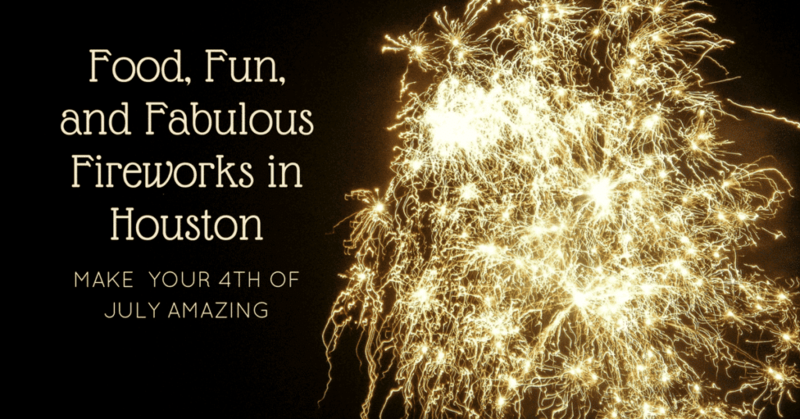 Enjoy fireworks and music at Houston’s CityCentre! Featuring a concert by People’s Choice Band at 7 pm. Fireworks will be on the 4th, but stop any night July 1st to 4th for some free and live music! If you’re near our Champions – Vintage Park or Magnolia locations, you may want to check out the festivities in Tomball. The Tomball annual street party will be July 4th from 5PM to 10PM. Live music, face painting and fun will be all day, with a fabulous fireworks display around 9PM. The Woodlands fireworks will be launched from Lake Woodlands, but there will be plenty of viewing spots, including: Town Green Park, Waterway Square Park, Hughs Landing, Northshore Park, and Rob Fleming park!